The art and life of leading Australian impressionist, Kasey Sealy spans both hemispheres. For the most part, the paintings currently displayed were painted during time spent in a small Tuscan hilltop village, beyond the tourist trail. It is here that Kasey paints and hosts well-attended tutorials for artists from around the world. This latest Italian Series of works includes a small selection of outstanding paintings of Venice. 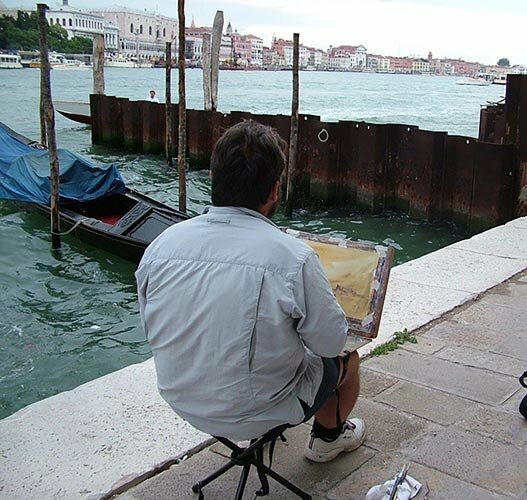 Working plein air the artist captures the tones, tides and timelessness of the Serene Republic.